Recently CA amazed us with the confirmations of muuuuuuch more new contents are coming, oh oh like a lot of goodies. 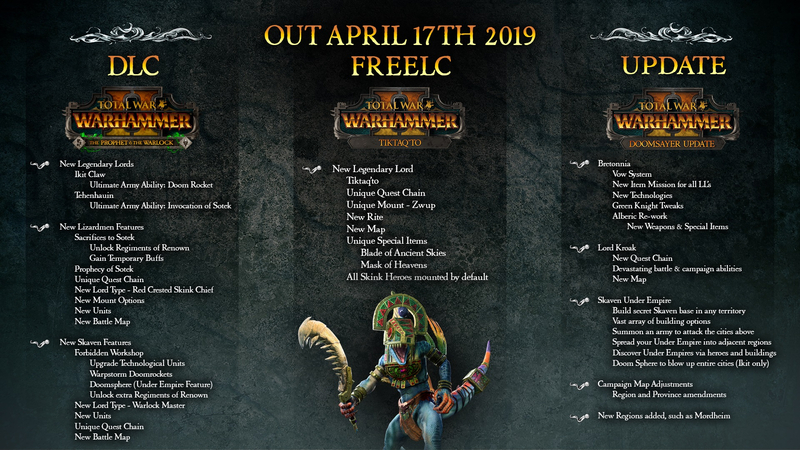 We all know that CA can use all the GW material they want in order to add stuff like units, LLs (White Dwarf, Forge World, Older Army-Books...) ...so...let's see what the future holds, bois! WARNING: I'd like to advice ya all that this thread is a *work-in-progress* . I'm running out of time, so i'll add all the rest ASAP. Surprise! With the strategic move to implement Lord Kroak as LH (Legendary Hero) CA opened a hell of a door for the addition of new LLs (Legendary Lords). Why? 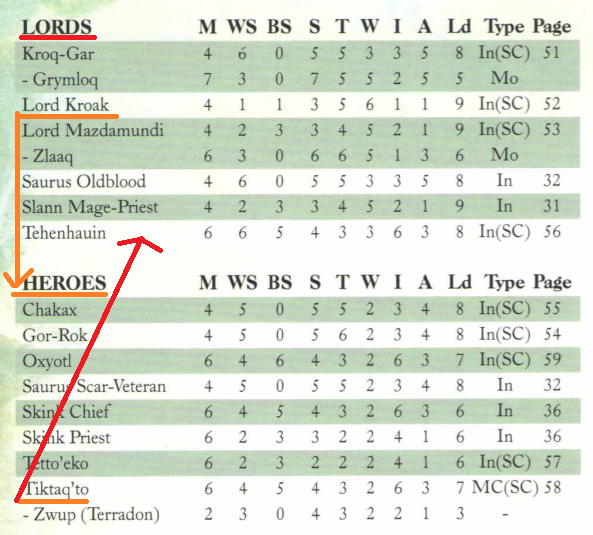 Ehehe, i'd like to remember you that Kroak is a Lord in the TT Game. That means...Heroes in the TT Game could be LLs in WH2 and vice versa. Amazing! That's right, mortals! The chances to see Cross-Game LPs, also known as WH1 vs WH2, are increased thanks to recent holy news. Ex. Skaven vs Empire - Beastmen vs Dark Elves. Feel free to discuss in the comments below. While I’m happy about all the new content and updates (except Tlaqua location) and the planned LPs, at the same time I’m sad about human races on WII, specially Araby. All what we received were undead races, not complaining, TKs are a must and VC2 are a very unique and interesting faction, but the game feels incomplete without another faction, human in this case, when you have a land where a human nation lives and when Its race have so much potential and It can spice up the campaigns so much, It feels a very big missed oportunity. I have an unusual bug. Araby takes up a huge area on the campaign map but it appears that there will be no new races added to TWW2. It's a most peculiar situation. Not sure what's caused it, but it really does need fixing. It's always hard to speak honestly. I don't want to mince words. The eve of a new DLC release is possibly a bit worrying for you. Every new product is a gamble. 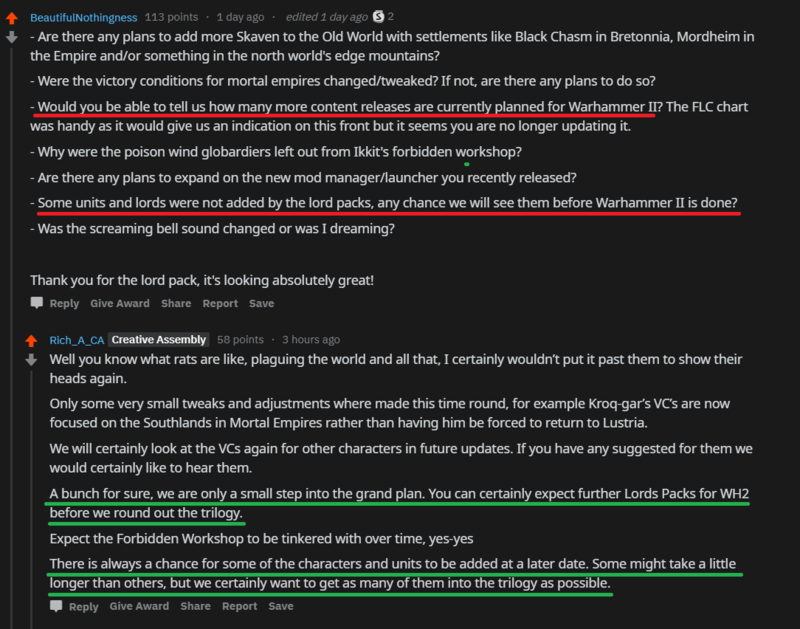 Rich_A_CA confirms multiple Lord Packs for WH2 and..."we're only a small step into the grand plan"
-----> Jeez, seems like there's A LOT of stuff yet to be released before WH3...oh my! As you all know, only Lord Packs are left. A funeral thread for the Dogs of War has already been created, but the true loser here is Araby. Come, children, and commemorate the loss of our Arabyan Nights, and realize there will be never anyone there to Show Us the World. Also, no Will Smith as Legendary Djinn Lord. The free Doomsayer Update will go live with The Prophet & The Warlock at around 3PM BST tomorrow, and brings a huge array of content additions, revisions, balances and improvements to the Eye of the Vortex and Mortal Empires campaigns!